Happy New Year all! The final instalment in our series predicting the big trends for Enterprise Mobility Management in 2019, comes from our EMM expert Henry Timpson. Prediction one: Rise in managed EMM. 2018 saw a huge increase in businesses of all sizes adopting an Enterprise Mobility Strategy (GDPR, maybe?). Deploying EMM is just one side of the coin; SOTI Inc highlights a poor understanding of mobility software can cause the same volume of downtime and lost revenue as having no strategy at all. Customers know they need to get more out of their EMM product and are admitting they do not have the skills in-house to fully utilise the product. Following last year’s trend, we predict an increase in businesses using a Managed Service Provider (MSP) to ensure their Enterprise Mobility Strategy hits the ground running. Prediction two: Growth of API's. When an EMM solution is used to its full potential it provides a vast quantity of data. We have already seen companies wanting to input EMM data into their current reporting systems, therefore we predict an increase of connections to SOTI’s APIs throughout 2019. Businesses quickly realise a fast resolution of mobile issues increases productivity and decreases lost revenue, why introduce a new reporting system when you have one that works! Prediction three: Increase in business adopting Apple for Business. On the face of it, this seems unrealistic. The cost of new iPhones and Apple products continue to grow year-on-year, making it financially daunting to contemplate an Apple device strategy across your business. But, with each new Apple launch, a guarantee to support the new iOS version on older devices is becoming the norm. This means that you can deploy a device and operating system that your team know and love for an affordable price. Pair this with zero-touch DEP and supplying apps remotely through one account with VPP and all the barriers are removed. We believe that more businesses will adopt an Apple solution in 2019 than any other year. Quiche, Quinoa or Quesadilla, surely must be one of the names for Android’s next operating system? None of them are sweet, perhaps an oversight on their behalf? I am flying the flag for Quiche, nothing beats a pastry case filled with eggs and cream! 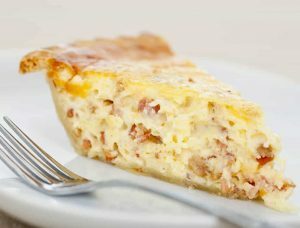 With that I am off to devour my favourite version the Quiche Lorraine, the new year diet can wait just one more day! If you enjoyed this, you can find more exciting articles and the first instalment of 2019 predictions here.